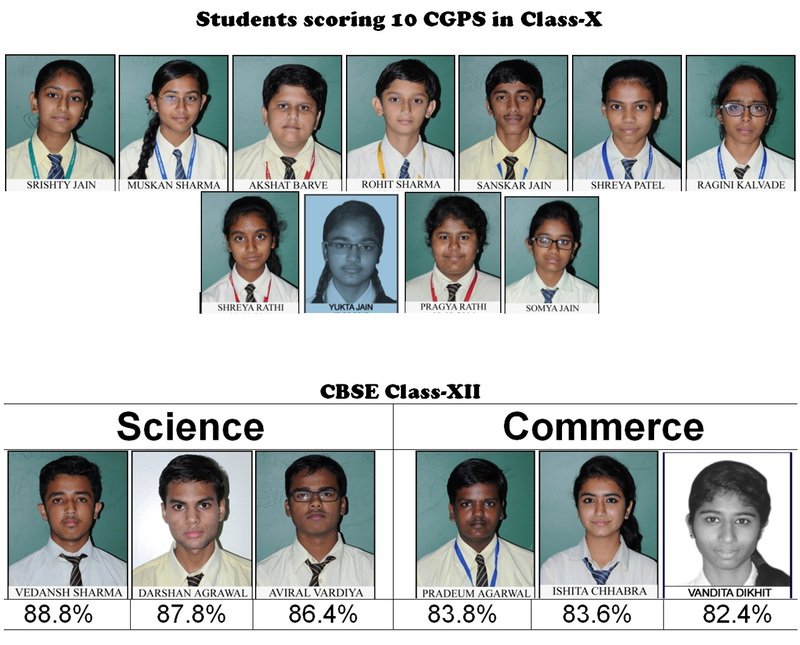 The Daly College, Laurels School International, Prestige Public School and Shishukunj International School – have been ranked in the top 10 leading schools of Central India. According to a recent survey conducted by ‘Digital Learning ‘ (India edition), a premier educational magazine of Asia, The Prestige Public School has been ranked on fifth position in Central India. Vibrant , vigilant and vigorous…… this is our young generation , the fast pacing and technologically equipped generation of today . We in Prestige Public School are striving hard to carve the young minds and shape their talents and continue to add world class students. It gives me immense pleasure to bring the third school newsletter “E-volve”, a small but earnest attempt to capture and encasing the treasure of talent and wisdom. We believe that as human beings we need to “E-volve” and broaden our mental vitas. As we usher in a new phase for our school , we take time to pause , turn around to look at the years passed and rejoice in the success we have achieved. We wish to correct the shortcomings of the past and look forward with a sense of hope towards greater growth and progress. There is no tried and tested formula for success for the Prestigians to reach the top. Success is not achieved by magic or mantras. Work, work & work, that is the only key to make our achievement. 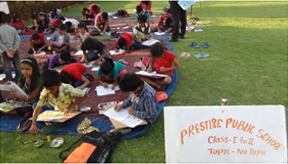 Prestigians set before them a target to excel and out shine in academics. Methodically and purposefully, they made use of every opportunity that came their way and finally made school and parents proud. The school has a well-equipped with over, 22.00 volumes which include books, videos, DVDs, CDs, subscription to periodicals which are added continually. 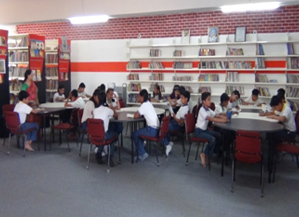 The library also provides students and teachers with a range of reference books, encyclopedia, journals and newspapers to enrich their classroom activities and knowledge. 1) Iken Scientifica Exam was conducted on 24th March 2013 in three categories the city round, zonal round & National finals. Sanskar Jain of class VII qualified and is selected to complete at National Level. 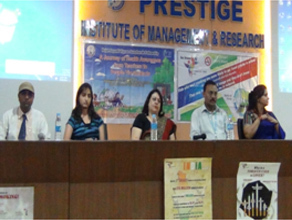 2) Choithram Institute of Educational Research and Training organized a workshop for Educators on 22nd and 23rd April 2013 under the topic “EXPLORING THE LEADER WITHIN” Mrs. Ankita Gurnani and Mrs. Amrita Kawthekar attended the workshop. 4) Pitamber Publisher on 26th April 2013 in Delhi Public School. 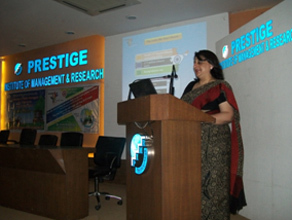 Ms. Maya Yadav and Mrs. Arpana Deshpande attended the workshop. 5) “GURU – A DEVELOPER OF A MULTI – TALENTED PERSONALITY” “Guru Purnima” was celebrated by class XII students on 22nd July with full zeal and ethusiasm. 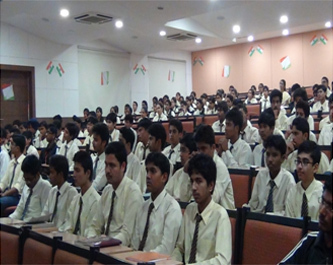 7) National Map Quiz Competition took place on 05th July in P.P.S. and in this endeavour two of our school teams got selected for National. Also at regional level our students hit the Quest and Mritunjay Malviya, Poorvansh Jain, Jayesh Panchal received consolation prizes. 9) “SANAND” The Rhythmic – an Expression. Our extremely talented junior and senior choir group got the opportunity to prove their rhythmic energy entuned. Loud applause and the compliments poured forth were heartening and motivating. 10) Billa-Bong High International School conducted Inter- School Eco-Friendly “GANESHA” Idol Making competition. Our students Aakruti Gupta, Durga Devi, Pragya Joshi and Tanisha Kushwaha brought their imagination originality and innovativeness in their work. That was awe-inspiring. 11) Independence Day : August 15 reminds every Indian of the sacrifice of freedom fighters and the spirit of dedication. The Principal unfurled the Flag thereby spreading the notes of patriotic symphony. As an activity, Inter-house patriotic song competition took place where Radiant House gave a benchmark performance. 12) Sports among youth is the epitome of vigour and vitality. 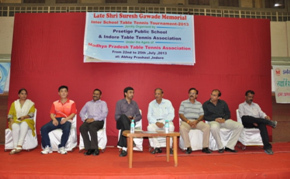 When this enthusiasm is channelised the product is simply mesmerizing which could be seen in Table-Tennis tournament organized as a joint venture of PPS and Indore Table Tennis association from 22nd to 25th July for all age group students. 13) To inculcate the Reading habit among the students anillibrary.com conducted “A SILENT READING COMPETITION” which was again tough to resist ,to develop patience, concentration and an art making its way silently from the heart to mind. 15) Art has been the language of Heart Mission Green International Art Competition Malaysia that came up with a contest and our students gave remarkable performance and had a wonderful time expressing their ingenuity. Certificates of Merit and DVD worth Rs. 1500/- was awarded. 16) We have a right and responsibility to leave a positive legacy to posterity for which we all will be remembered and “CHILDLINE INDIA FOUNDATION” is one of the organization to create awareness among the children and providing toll free number in case of need and security. Our school students were benefitted largely and inspired to the atmost. 17) Renowned speakers Dr. Aarti Kaul Patel (Oncologist) and Dr. Shahirose Kapadia (Physiotherapist) sponsored by “SHARP” brought in a workshop for class XI & XII students in concerned with the threats and after effects of Tobacco consumption as well as alcohol consumption . An attempt to lignite the minds of the youth was quite successful. On 14th June Swami Prabhuddha Nand Ji of Chinmay Mission addressed the faculty of Prestige Public School. He spoke about today’s demand & society. He was emphasized the role of a ‘real teacher’ as now – a - days teacher are only teaching, moral ethics, bonding between a teacher and a student is lost. He focused on how a teacher can change the future of the students to keep ethical, valuable cultured asset of the nations. Rigorous academic procedures, commitment to quality education provided by Indore Sahodaya Schools Complex were able to bring revolution in science through Bal Vigyan. Our students gave a good fight with redoubled vigour and competed with full determination and zeal and thereby brought laurels to the school. The Mathematics project “BRTS- A Solution to a Problem or a Problem in itself” got the first position. The team will be representing Indore Region at IIT- Mumbai. The Bio-project received “BEST PROJECT REPORT & PRESENTATION” for the topic “Health Promotion”. Chemistry project was not behind and bagged the award of “BEST AIM & UTILITY”. Still more achievements awaiting ahead was our Social Science project awarded for the “BEST IDEA-RELATED TO THE THEME”. 1) Can We create a Scientific temper in Young Indians ? 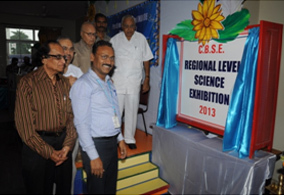 Yes, Our Successful Event – Regional Science Exhibition at Prestige Public School is the answer to the question. 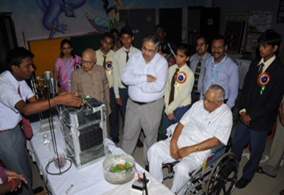 Regional Science Exhibition was one of the most significant step to source the interest of the students. Nearly 60 different schools all over M.P. exhibited their 100 Models. 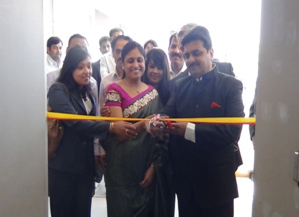 Dr. N.N.Jain inaugurated the exhibition. All the dignitaries along with the judges and various school Principals appreciated the kind of efforts and enthusiasm seen among the students in their presentation. 10 remarkable thought provoking Models were selected for Nationals. Students scientific temper and their inherent talents were remarkable. 2 Prestige Public School got the privilege to host mathematics Bal Vigyan 2013 in collaboration with Indore Sahodaya and IIT Bombay. About 20 schools gave their presentation on the topic BRTS: “a solution to a problem or a problem in itself.” Various delicates of Indore BRTS also attended the event. 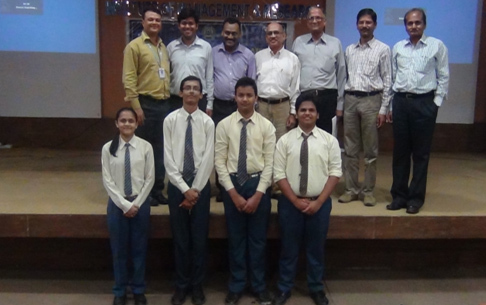 Our school team comprising of Anubha Barve, Rohan Shrimal ,Praveen Jangid, and Rohit Jangid participated at Annie Besant school in cluster 2 and stood among top three teams. Finally, our school team after going through the second phase of the competition would be representing Indore region at IIT Bombay (Powai). CONGRATULATIONS !! to our young minds and their mentor who brought moments of glory for the school.